We routinely Norman Koren's excellent "Imatest" analysis program for quantitative, thoroughly objective analysis of digicam test images. I highly recommend it to our technically-oriented readers, as it's far and away the best, most comprehensive analysis program I've found to date. The Nikon D40 showed pretty good color accuracy, not quite as good as the D80, but still very good among the cameras we tested. It got a little carried away with strong reds and blues (a fairly common response with this target, the MacBeth ColorChecker), and was slightly undersaturated on the strong yellow and yellow-green swatches Hue accuracy is very good to excellent, with most of the hue shift occurring in the cyans and blues. Average saturation was 113.4% (oversaturated by 13.4%, mostly in the reds and blues as well), average "delta-E" color error was 6.57 after correction for saturation. All in all, a very good color response for an SLR, just a little off the best we've seen. 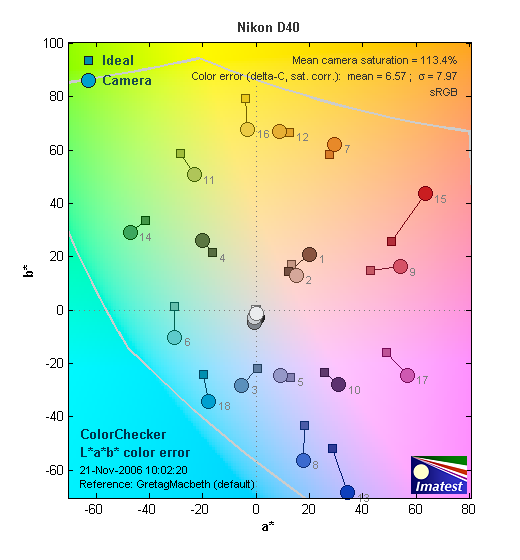 This image shows how the Nikon D40 actually rendered the colors of the MacBeth chart, compared to a numerically ideal treatment. 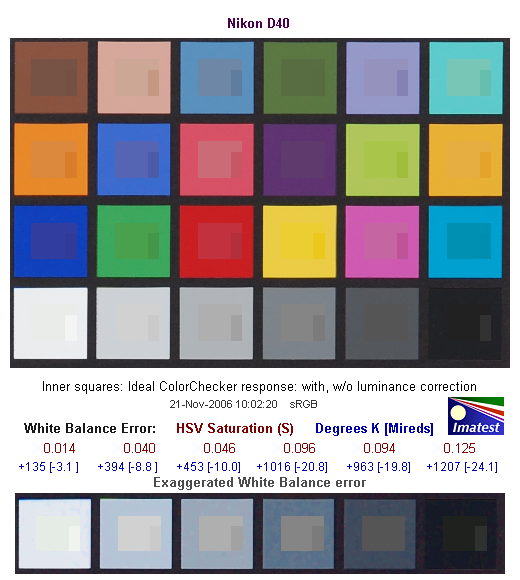 In each color swatch, the outer perimeter shows the color as actually captured by the camera, the inner square shows the color after correcting for the luminance of the photographed chart (as determined by a second-order curve fit to the values of the gray swatches), and the small rectangle inside the inner square shows what the color should actually be, based on perfect rendering in the sRGB color space. This image shows the excellent hue accuracy, as well as a gamma curve that results in an overexposure of highly saturated swatches. There's a lot in this particular graph, a lot more than we have room to go into here. 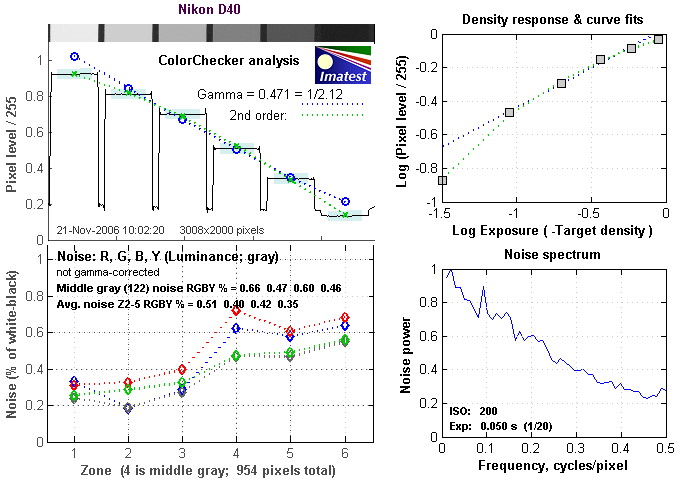 Bottom line, the Nikon D40's noise levels are low at low ISO, with a frequency spectrum that has a bit more energy on the higher frequency (right-hand) side of the curve than do some cameras. In comparing these graphs with those from other competing cameras, I've found that the Noise Spectrum graph at lower right is the most important. Cameras that manage to shift their noise spectrum to higher frequencies have much finer-grained noise structures, making their noise less visually objectionable. In the graph above, this would show up as a noise spectrum curve that remained higher on the right side, representing higher noise frequencies. The champion at this was the Canon EOS-1Ds Mark II, which produced remarkably fine-grained image noise, even at very high ISOs. The D40's noise spectrum a bit more conventional, with more weight on the left side of the noise spectrum plot than the 1Ds managed, but still with a good noise structure overall. Here's the same set of noise data at ISO 1,600. Here, the Noise Spectrum graph is shifted a bit more toward the left-hand, lower-frequency side than it was at ISO 100, coarsening the "grain" of the image noise patterns somewhat. In the D40, while the frequency distribution of the noise shifts more to the lower range, its overall noise amplitude remains pretty low. The image below shows the test results from Imatest for an in-camera JPEG file from the Nikon D40 with a nominally-exposed density step target (Stouffer 4110), with the D40's contrast setting at its default position. These are very good numbers for an in-camera JPEG, but the dynamic range number at "high" quality itself (7.28) isn't the most important thing to look at here. A dynamic range of 7.28 f-stops at high image quality is within a hair of the best DSLRs we've tested (apart from the Fuji S3 Pro), but equally important is the shape of the tone curve. More significant than the absolute dynamic range is the fact that the curve tails off nicely at both the highlight and shadow ends, providing a smooth transition from quarter-tones to both highlight and shadow, making for smooth-looking images even after considerable tone-curve adjustment on the computer. We normally process the dynamic range test files through Adobe Camera Raw (ACR), but as of this writing in early December, 2006, Adobe hadn't yet released support for the Nikon D40. 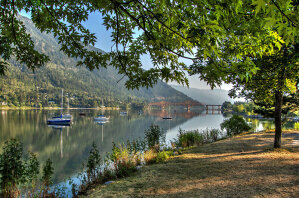 We'll try to come back and update these results once a version of ACR is available that supports the D40. While we don't have the results of a RAW conversion available to judge by at this point, the JPEG images straight from the D40 show really excellent dynamic range. Previously, the champion for dynamic range from Camera JPEGs (leaving out the Fujifilm S3 Pro, with its dual-pixel sensor technology) was the Nikon D50, with the Canon EOS-20D coming in close behind, exceeding the D50 at some noise thresholds, falling behind very slightly at others. Looking at the table below, the D40 appears to run neck and neck with its predecessor, with about 7.3 f-stops of dynamic range at the highest quality level (restricting images noise to 0.1 f-stop), and 8.9 stops with a noise threshold of 1/4 stop. One thing that's going on here though, is that we tested each camera at its lowest ISO setting, which should produce best-case noise levels. This is in fact what many photographers will be most interested in, but it does perhaps place some of the Nikons (like the D40) at a disadvantage, as their lowest ISO setting is 200, as compared to the ISO 100 settings available on most other models. The chart above shows consolidated results from spatial frequency response measurements in both the horizontal and vertical axes. The "MTF 50" numbers tend to correlate best with visual perceptions of sharpness, so those are what I focus on here. The uncorrected resolution figures are 1,570 line widths per picture height in the horizontal direction (corresponding to the vertically-oriented edge), and 1,207 lines along the vertical axis (corresponding to the horizontally-oriented edge). Correcting to a "standardized" sharpening with a one-pixel radius brought the vertical resolution close to the horizontal, resulting in an average of 1,615 LW/PH. This is a good performance for a 6-megapixel camera. To see what's going on, refer to the plots below, which show the actual edge profiles for both horizontal and vertical edges, in both their original and corrected forms. Here, you can see that (for whatever reason), the vertical edges (first plots below) have a very subtle in-camera sharpening applied, resulting in very clean edges with almost no overshoot. In contrast, the horizontal edges show more evidence of sharpening, with the unaltered JPEG showing moderate overshoot. (This results in slight halos around vertical edges.) As discussed in the main part of this review, the D40's unadjusted JPEG images make good-looking (if very slightly soft) prints as large as 13 x19 inches. For the ultimate in sharpness though, dial down the camera's internal sharpening and process the resulting images after the fact in Photoshop or other image-processing application to bring out the maximum detail without introducing sharpening artifacts.